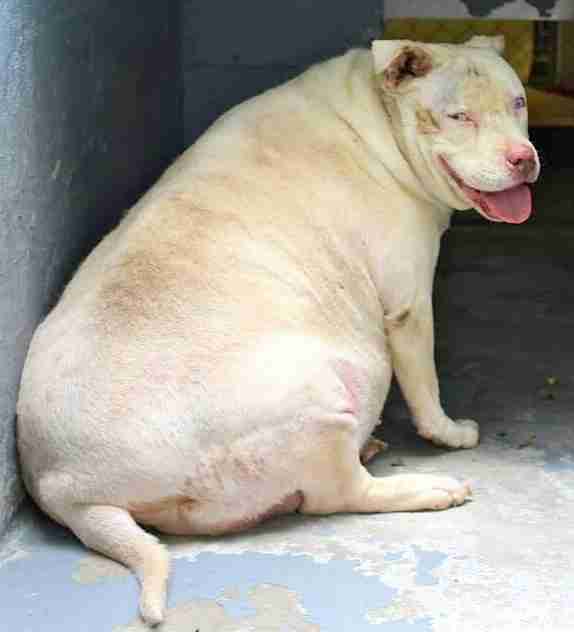 She lost half her weight — and now she's ready for a family. Olympia was so unusually large, back when she was first taken in off the streets, the animal shelter didn't have a scale big enough to weigh her. It was July, and Olympia had been discovered roaming loose in Virginia. 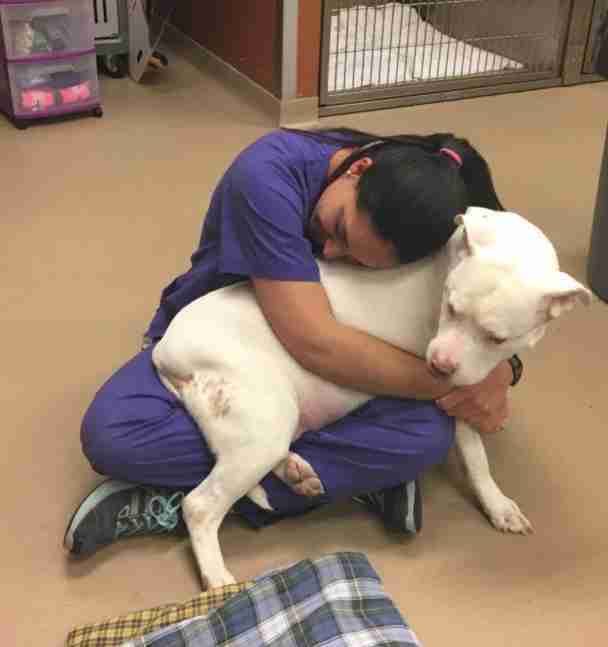 When the shelter she was brought to — Montgomery County Animal Shelter in Christiansburg, Virginia — was finally able to assess her, Olympia clocked in at 128 pounds. A dog like her should probably weigh half that. 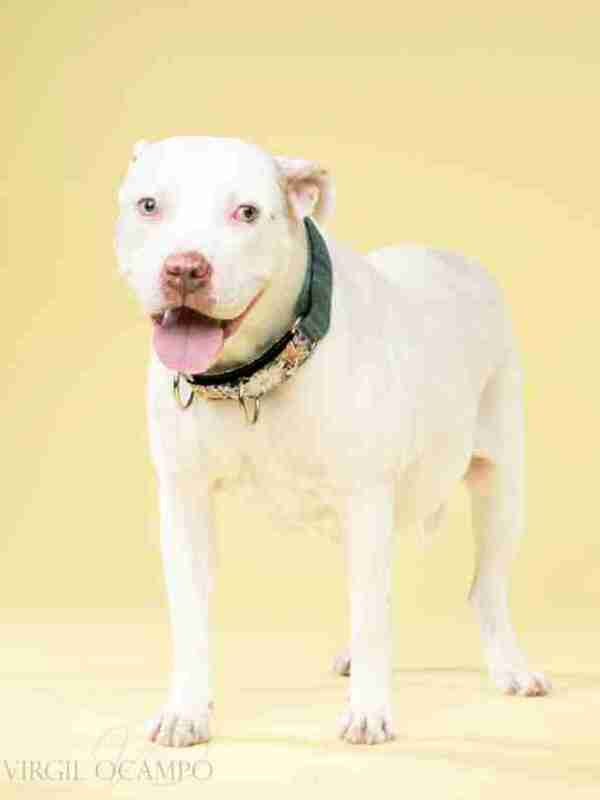 The shelter is located near the Virginia-Maryland Regional College of Veterinary Medicine, and a professor specializing in veterinary nutrition came up with a diet for Olympia. Staff began giving Olympia short walks, which was all she could handle given her weight and associated knee problems. It was clear this sweet girl would need more than the shelter could provide, in order to get her well enough for a permanent home. 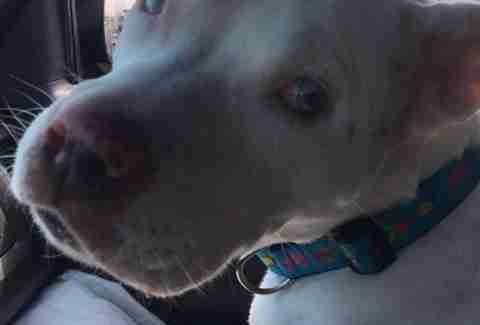 So a plea was put out for a rescue group to step in. 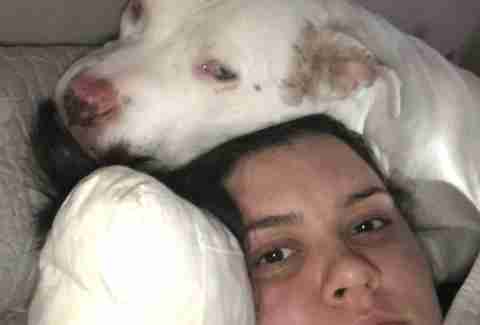 Lindsay Vega, an emergency veterinarian with VCA Veterinary Referral Associates in Gaithersburg, Maryland, saw the plea and shared it on Facebook, hoping someone would step up. 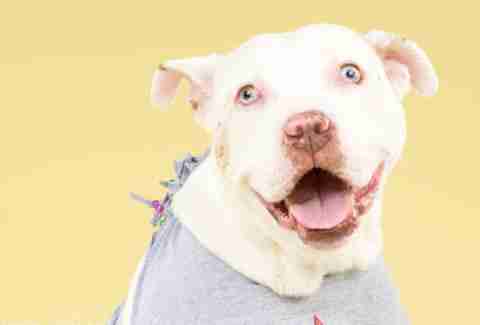 Then she and some coworkers thought that perhaps they could be that someone, and foster Olympia at their animal hospital. Those in charge agreed. Olympia's been with them since August, and she's proven herself to be "a wonderful, wonderful dog," Vega tells The Dodo. Olympia has spent the last nine months at the animal hospital, getting into shape. She's had acupuncture, underwater therapy, a special exercise regime and surgery to repair her worn-out knees. 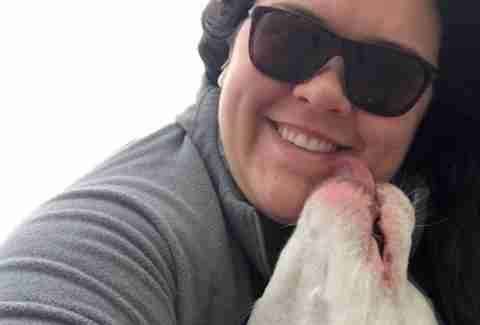 These efforts, plus a prescription diet, have gotten Olympia down to 70 pounds, which is within around 10 pounds of her goal weight. Along the way, she's endeared herself to everyone lucky enough to meet her. Olympia is a social butterfly who is sassy and stubborn and affectionate and sweet, according to her carers. Her body may have shrunk, but her spirit has not. "Oh my gosh, super big personality," Vega says. Svelte, healthy and loved, Olympia is ready to find her forever home. She’s looking for a family who will love her enough to help her stick to her diet — and let Vega come over from time to time for a visit. Olympia loves every person she encounters, but isn't such a fan of other dogs (and can be a little too interested in cats). That's why the completely smitten Vega — who has another dog at home — isn't adopting her. 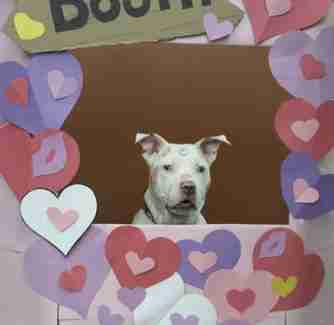 "It tears my heart in half to be looking for a home for her," Vega says. Vega feels confident that Olympia will be adopted soon enough. 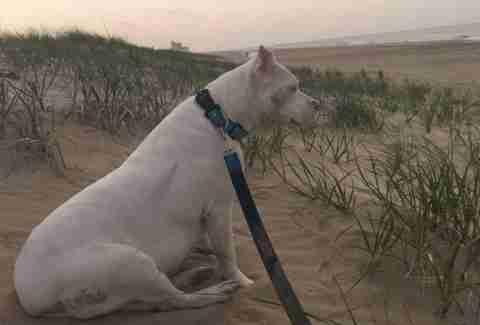 So she recently asked her parents to look after her own dog for the weekend, and took her beloved foster dog on a weekend trip to the beach in Delaware. They walked on the beach, where Olympia was more excited about the people she could greet than swimming in the water. They stayed in a hotel, where Olympia slept on the bed. Vega was struck, as always, by how wonderful Olympia is. How much she's overcome, and how many wonderful experiences are ahead. 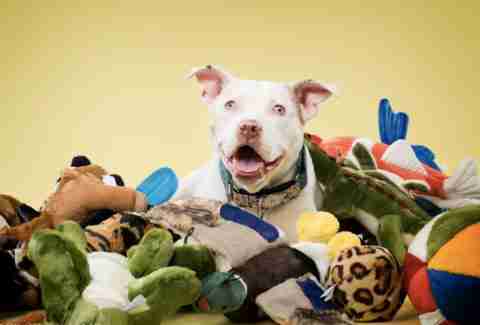 "I was like, 'You're the most amazing dog,'" she says. "I feel very honored to have been part of her journey. It's been a blessing for me." It being vacation, Olympia even got to indulge in a little extra snacking. On the boardwalk, she put her paws up on the window of a famous caramel corn stand. The people working there fed her a few pieces of popcorn. As with nearly everything Olympia encounters, she loved that, too. Find out more about adopting Olympia here.